Hello everyone! 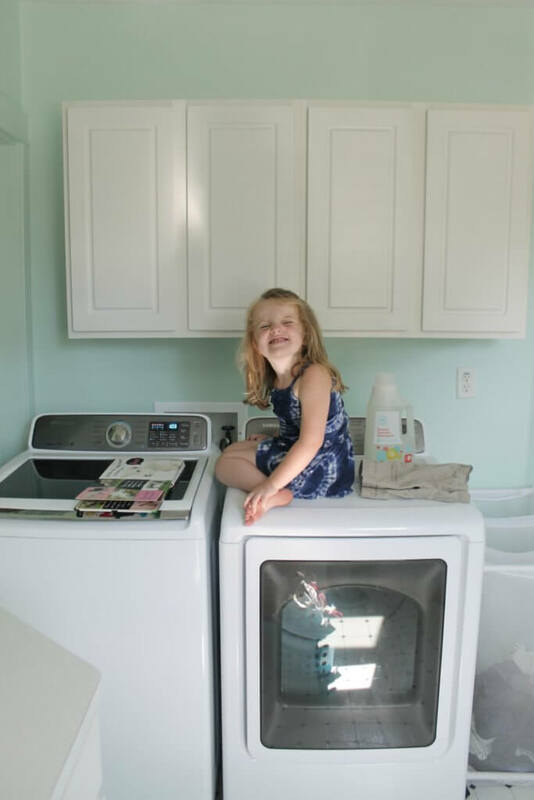 Welcome back to week two of the $100 Room Challenge, hosted by Erin at Lemons, Lavender, Laundry. This week I’m excited to share my inspiration for the makeover with you guys, and maybe a quick sneek peek at my progress. This week was suuuuuuper boring and not fun at all, as I spent EVERY. SINGLE. SECOND. of free time painting. And not the fun kind of painting where you get to roll. The kind where everything is brushwork. There were so many windows, doors, trim, cabinets, and toilets to trim around and I am so over it. BUT…..one coat of primer and two coats of white paint later, we are finished. Wanna see a comparison shot? Speaking of plans, I want to share some of my inspiration for this room. Since a major part of the transformation is going to be the cabinets, I thought this might be the perfect opportunity to try painting them gray. I really want to try gray cabinets in my kitchen, but as that reno will neither be DIY nor a $100 challenge, I’m a little bit chicken about the whole thing. 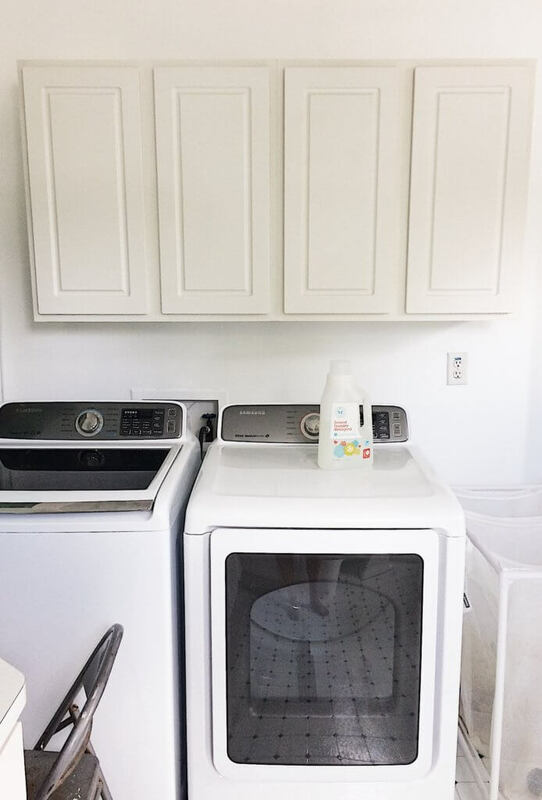 I thought putting gray in my laundry room would be a great way to test drive it without any commitment. I’m using my go-to gray, called Mindful Gray by Sherwin Williams, mixed into Lowe’s Valspar brand. Don’t ask me why, but I actually like the color mixed better at Lowe’s than I do at Sherwin Williams. Also a fun fact: If you’re checking out at Lowe’s and you happen to spill your quart of paint all over their floors, not only do they happily clean up your mess, they let you pick out another quart for free. Bless those people at Lowe’s, they saved my budget! 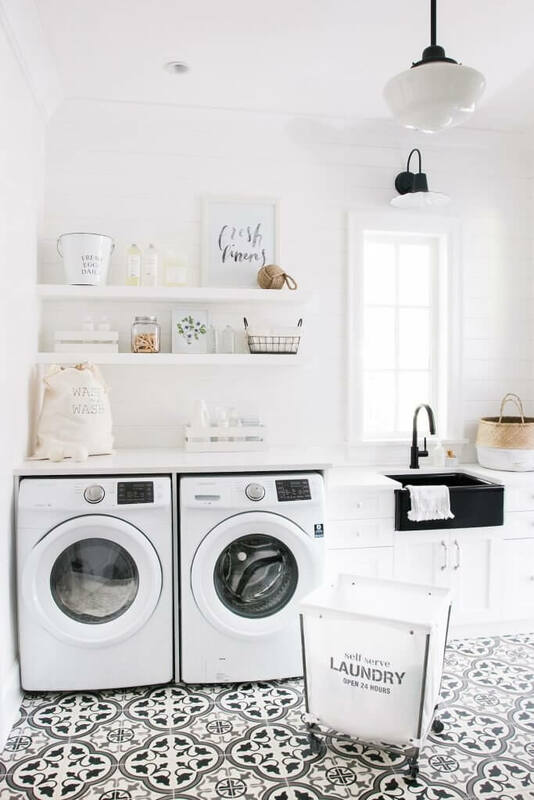 While my finished laundry room isn’t going to look much like this, I think its the feel of the room that I love and am going to replicate in my own way. I mean, c’mon, Monika Hibbs can do no wrong here! And I may or may not have a special surprise coming for this room that was totally inspired by her “fresh linens” print! While I’ve only checked off two items from my list so far, I am not worried at all, as they were by far the biggest mountains to climb! I’ll be back next Wednesday to show you our progress, and hopefully introduce you to my cheat-backsplash idea!! Follow along on the journey with me on Instagram!! Whoever invented paint is better than sliced bread. Totally changed the space! Also, those are some of my favorit inspiration photos! Can’t wait to see how it turns out! Love it!! Did you notice that Lowes is now carrying Sherwin Williams? I spotted that the other day. Kinda funny cause around here, the two are right down the street from each other. I love that gray too. Also, good to know about the spilled paint. #oops My laundry room is on my future to do and I am loving the tile floors that you showed from another laundry room. Gold + gray are also AWESOME together so good call on the hardware. I can not wait to see this awesome space done. Looks great so far! so light bright and beautiful! Can’t wait to see how it turns out. The white paint makes such a difference! Don’t give up! Painting is the big thing on my list this week!! Luckily for me I don’t have a bunch of stuff to paint around (well other than the urinal…lol). And we are going to be working on adding a little surprise I didn’t originally plan for!! It so happy and bright! I love how paint can pack such a punch! Love the white walls… and what a great idea to test the gray cabinets in here vs doing all that work in a kitchen and (maybe) finding out you don’t love it. Oh wow!! You’ve been busy and your hard work is definitely worth it! 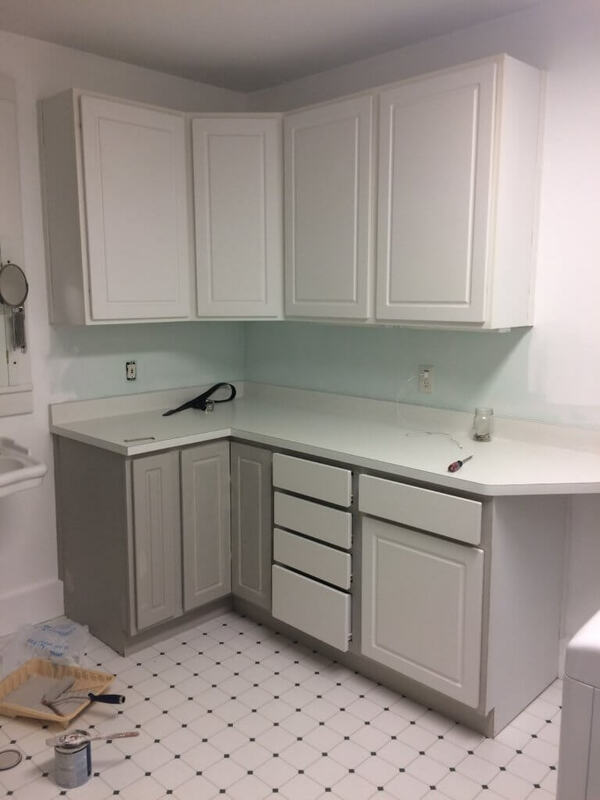 It looks amazing so far – those gray cabinets are going to be so fabulous!! Can’t wait to see the rest! Aww thank you so much, Melissa! I hope it comes together!!! ? I feel your pain about all the brush painting! But it’s looking great, and I love the gray and gold idea! This looks great!! 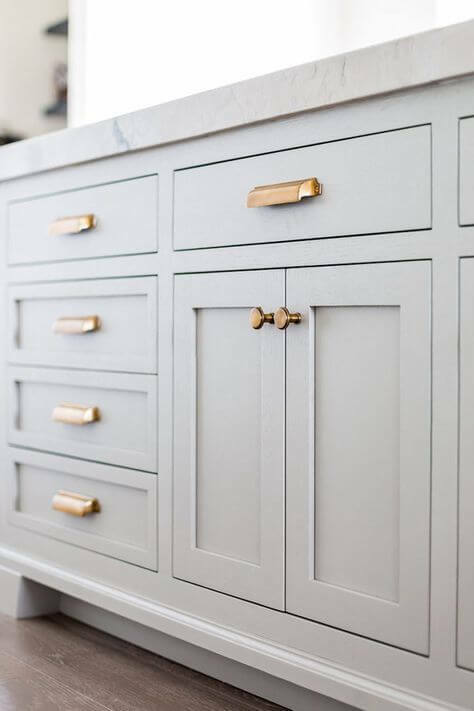 I lOVE your insp pic and cannot wait to see how your grey cabinets and gold hardware turn out! 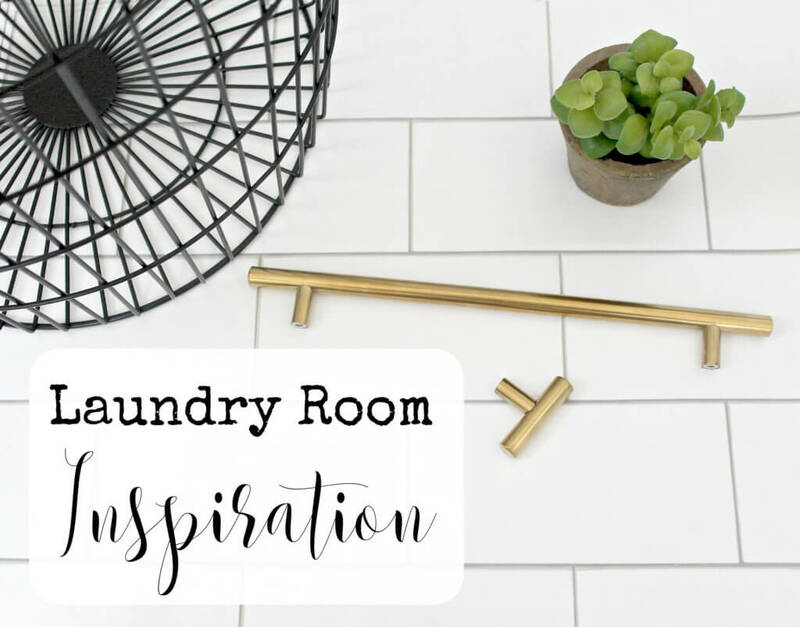 I have also wanted to experiment in our laundry room! Love the color you chose for the cabinets! WOW!! What a difference! This is going to be such an incredible before and after. I love your inspo images! LOVE the colors! The cabinets look amazing! I may have to copy that color combination for my own laundry room! Can’t wait to see the finished room! Seriously I am in love with that hardware. It is amazing! Love the paint color! !